Stop missing them! And tune into "America's Classic Standards" with Bill Alexander at 6 p.m. Saturdays, with a rebroadcast at 5 p.m. Mondays and 9 a.m. Wednesdays. Bill brings you the very best of American popular music from the past and present every week, and he takes your requests at (724) 330-3444, or at ACS@BillAlexander.net. And make sure to check out his playlists at https://americasclassicstandards.com. If you were a regular Joe and you had a regular show, what would you call it? Probably ... "The Regular Joe Show"! WMCK.FM is extremely excited to have 25-year radio and TV veteran Joe Hart and his unique takes on the air, every Wednesday night. Previously of WWNW-FM, WKBN AM/FM/TV and a mobile wedding dj of 22 years, Joe bring his music chops to WMCK.FM, blending stories and commentary with a mix of rock, metal, and progressive music. The Regular Joe Show airs from 9 p.m. to midnight Wednesdays, with repeats at 1 p.m. Mondays and 5 p.m. Thursdays on the New Sound of the Mon Valley, Internet radio WMCK.FM in McKeesport. Ever thought about having your own radio show? Some restrictions apply: People under age 18 must have supervision from a parent or guardian, and all applicants must be able to pass a background check and be willing to comply with station rules and policies regarding content and profanity. Women and minorities are encouraged to apply. Shows can be declined for any or no reason, but WMCK does not and will not discriminate on the basis of any classification protected by Allegheny County. Email wmck@wmck.fm for details. 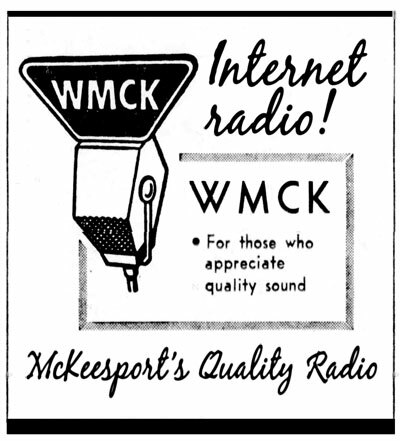 WMCK Internet Radio is a service of Tube City Community Media Inc.